By the 13th century, European astronomers had access to information on planetary movements and other observations of the heavens that had been compiled by Arab astronomers in 11th-century Spain. This knowledge, with its methods of observation and emphasis on the natural world, was part of an intellectual revolution taking place in the late middle ages. Christian theologians responded to the new knowledge by integrating it into the church's doctrine. Monasteries provided the intellectual environment where the latin translations of arabic books were copied and studied. 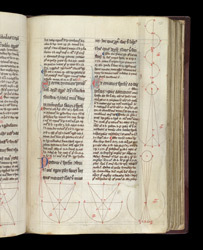 This manuscript of astronomical treatises belonged to St Augustine's, Canterbury. The astromonical treatises are complemented by works on mathematics, many of them handed down from ancient greek and roman writers, often via arab translations and commentaries. This page has part of a work called 'On Weights', which discusses the principle of the lever, although it has many inaccuracies.